In this article, we will discuss the architecture(core classes and interfaces of Java Persistence API) of the JPA specification. The Java Persistence API (JPA) is the Java standard for mapping Java objects to a relational database. Mapping Java objects to database tables and vice versa is called Object-relational mapping (ORM). 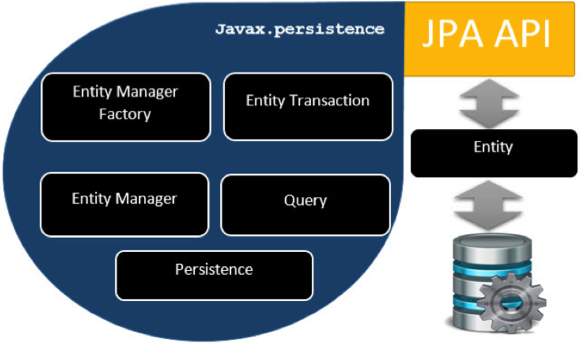 The Java Persistence API (JPA) is one possible approach to ORM. Via JPA the developer can map, store, update and retrieve data from relational databases to Java objects and vice versa. JPA can be used in Java-EE and Java-SE applications. JPA is a specification and several implementations are available. Popular implementations are Hibernate, EclipseLink and Apache OpenJPA etc. 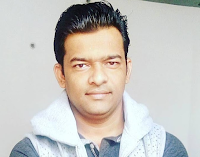 Java Persistence API is a source to store business entities as relational entities. It shows how to define a PLAIN OLD JAVA OBJECT (POJO) as an entity and how to manage entities with relations. The following image shows the class level architecture of JPA. It shows the core classes and interfaces of JPA. Let's describe each of the units shown in the above architecture. EntityManagerFactory - This is a factory class of EntityManager. It creates and manages multiple EntityManager instances. EntityManager - It is an Interface, it manages the persistence operations on objects. It works like a factory for Query instance. Entity - Entities are the persistence objects, stores as records in the database. EntityTransaction - It has one-to-one relationship with EntityManager. For each EntityManager, operations are maintained by EntityTransaction class. Persistence - This class contains static methods to obtain EntityManagerFactory instance. Query - This interface is implemented by each JPA vendor to obtain relational objects that meet the criteria. The above classes and interfaces are used for storing entities into a database as a record. They help programmers by reducing their efforts to write codes for storing data into a database so that they can concentrate on more important activities such as writing codes for mapping the classes with database tables. In the above architecture, the relations between the classes and interfaces belong to the javax.persistence package. The following diagram shows the relationship between them. The relationship between EntityManagerFactory and EntityManager is one-to-many. It is a factory class to EntityManager instances. The relationship between EntityManager and EntityTransaction is one-to-one. For each EntityManager operation, there is an EntityTransaction instance. 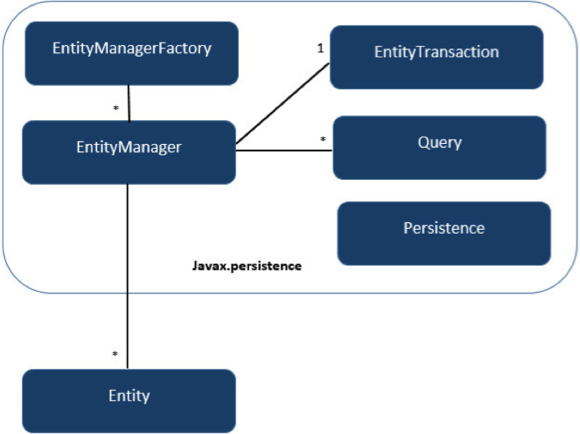 The relationship between EntityManager and Query is one-to-many. Many numbers of queries can execute using one EntityManager instance. The relationship between EntityManager and Entity is one-to-many. One EntityManager instance can manage multiple Entities. Let's demonstrates the usage of core classes and interfaces of javax.persistence package. Here we are using @Entity, @Id, @GeneratedValue and @Column annotations for mapping between Java object to database table columns. Note that from above Class Level Architecture, we are using EntityManager, EntityManagerFactory and EntityTransaction interfaces in this snippet. In this example, we use persist() method to store student object into the database. Read complete example at JPA 2 with Hibernate 5 Bootstrapping Example - In this post, we will show you how to create or configure a simple JPA application with Hibernate.